Stella Artois is running a television and cinema advertising campaign promoting the 4% Smooth Lager. The ‘Triple Train’ ad begins with a dishevelled young man spotting a beautiful brunette on the station platform as the departure whistle for her train blows. With a raised eyebrow he spontaneously follows her onto the train climbing aboard carriage number three as the train steams away. Leaving a collection of baffled observers in his wake, we see him work his way stealthily from carriage to carriage whilst undergoing a smooth, triple transformation. 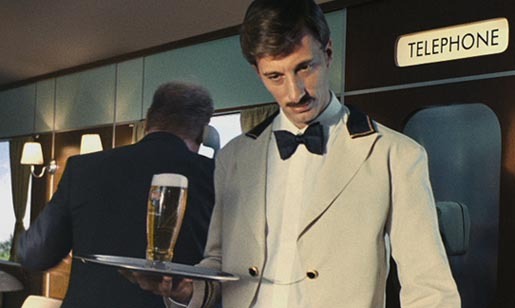 From casually dressed chancer to ticket collector to moustachioed waiter, he finally emerges in the first class carriage where he undergoes his final transformation to smooth and dapper gentleman. Following his triple filtered makeover, our hero finds the beautiful woman reclining by the bar. Our cool, calm and collected main man gets his smooth outcome as he enjoys a perfectly poured, chilled Stella Artois 4%. The Train ad was developed at Mother London by executive creative director Mark Waites, creative director Gustavo Sousa, creatives Freddy Mandy and Tim MacNaughton, and agency producer James Lethem. Filming was shot by director Agustín Alberdi via Stink, London, with producer Robert Bray. Alberdi is also represented by Oriental Films and Circo Films. Post production was done at The Moving Picture Company, London, by producer Andandi Peiris, VFX supervisor Tom Harding, VFX team Stirling Archibald, Lisa Ryan, Charlotte Tyson, and colorist Paul Harrison.